In honor of July 24 being Cousins Day, I share the following picture from the summer of 1982. 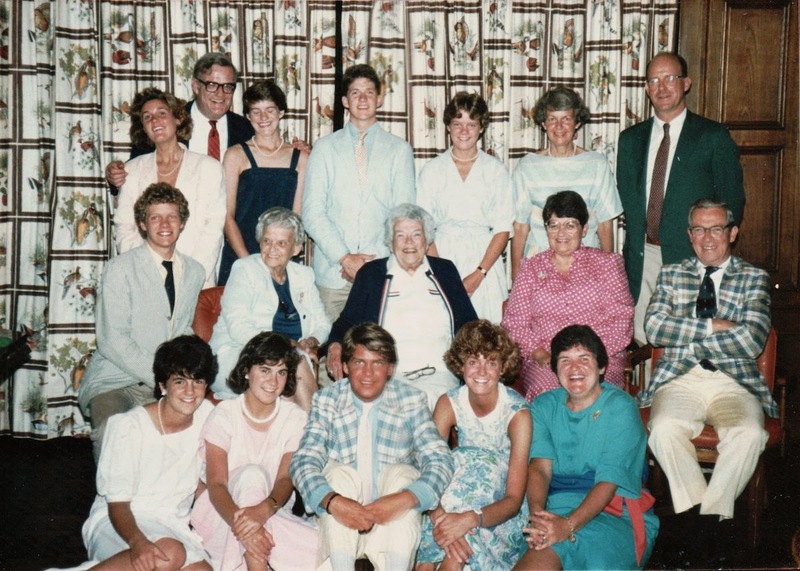 My grandmother, Helen (Hunter) Copeland (1907-1990) is in the middle, with her sister, Margaret Hunter (1905-1994) sitting next to her. She is surrounded by her three daughters, three sons-in-law, and nine grandchildren. She couldn't be any happier! What a lovely photo-- and I recognize you, I think-- third from the right in the back, with the white dress? Karen - very good for never having met me in person ;-) and I think it was a pale blue dress. Thanks for the comment.